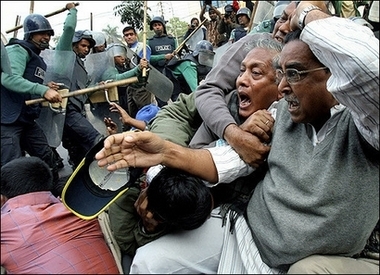 Bangladesh is facing a huge political turmoil in coming days that has been predicted for quite sometime. At the end of three day siege organized by the 14th Party alliance turned very ugly when the Police used brutal force against the political activists on January 9th. Top leaders of the 14th Party alliance were gravely injured when the Police assaulted them with the maximum force. Naturally, it poses a valid question, why have the Police taken such a hard line? It happened as the higher ups in the Police have been assured that the BNP-Jamaat led Government will return to power again. It is a sad reality that the Police can never win political opposition and agitation. The current political turmoil has drawn international attention. The BNP-Jamaat led Alliance may win the election by force in a race less election but they won’t get international acceptance. International Political Observers have already lost their interest to monitor the upcoming election. Using the Military to quell political unrest won’t yield much result in favor of the BNP-Jamaat Alliance. As the election is moving to uncertainty, they’re quickly loosing their influence and support over the people. Internal rifts are growing. People are loosing patience. Had the two main opposition parties in Bangladesh agreed to reform the caretaker government and the Election Commission, we could escape this political crisis. BNP-Jamat’s insistence and selfishness have thrown the country to this political crisis that the people are paying price for. Now they’re realizing that they can not run and win this upcoming election by hook or crook. They’ve shown their immaturity to foresee their future as now they’re quickly loosing political ground and people’s support altogether.